African Violets - African Violet Society of WA Inc. The first two species of were discovered by Baron Walter Von St Paul, and found in two different locations: the first at about 45 to 150 metres above sea level in the fissures of limestone rocks, in wooded places growing in rich soil with plenty of vegetable matter. 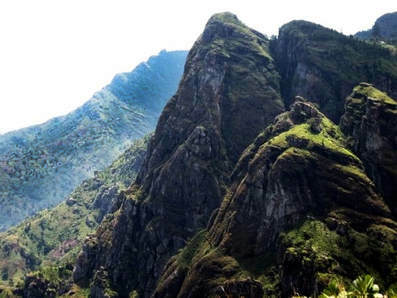 The second site was in the shady primeval forest area of East Usambara Mountains of northeastern Tanzania in tropical East Africa, with no granite rock, at about 700 metres above sea level. Although they were not at first recognized as being two different species, the first was Saintpaulia ionantha, one of two species from which all modern day hybrids are thought to have come. It is probably from S. ionantha that modern hybrids have inherited the ability to withstand higher temperatures; since the average day temperature of its original habitat was 26 degrees Celsius. As more species were discovered, the range of altitudes in which the Saintpaulia was known to grow became wider. One species, S. goetzeana, grew in mosses at 1200 to 1500 metres in primeval forest. This species is very difficult to grow, particularly under home conditions. It flowers and requires warm day conditions but very cool night conditions, which would not be suitable for most modern cultivars. Another species, S. orbiculan's, was found growing in the shade with daytime temperatures reaching 32 degrees Celsius and 10 degrees Celsius at night, at an altitude of 1200 metres. S. grotei was found growing in dense shade near running water, but needed perfect drainage. S. pusilla was found on large mossy boulders in primeval forest. S. confusa grew on gneiss rock but needs more water during cultivation. S. shumensis, on the other hand, grew in dry forest on cliff faces and doesn't need so much water. S. grandifolia grew in fertile clay soil. S. difficilis appeared to have kept its options open by being dis­ covered in three areas: on rocks by a stream, in evergreen dry forest and on damp rocks in an evergreen rain forest. Saintpaulia inconspicua, which was believed to have been lost during World War II, was found only occasionally in moist forest soil. Another species, S. magungensis var. S. occidentalis, is now believed to be extinct in Africa. The area in which it was discovered became farmland on which sisal was grown. While this article covers only a small proportion of the Saintpaulia species, it shows that the range of habitats under which they grew was very broad. It follows that, in order to grow species Saintpaulia successfully, the ideal culture conditions under which they are grown should mirror as closely as possible the natural habitats under which they were discovered, particularly in the areas of temperature and type of soil used (since some species require more or less water than others) . Light should also be considered, as light conditions ranged from heavy to very light shade. While it would be extremely difficult for any one person to grow all available species under home conditions, it would be great if all Saintpaulia growers tried to grow at least one species - it would be a catastrophe if any more were lost.